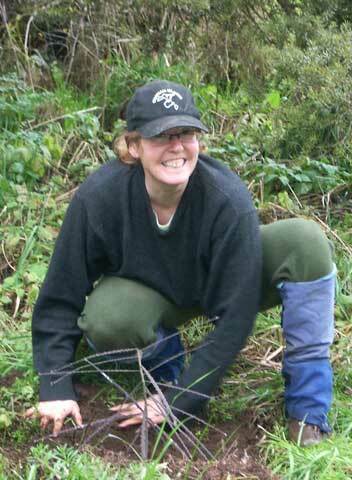 I first got into studying biodiversity because I wanted New Zealand’s plants and animals to be looked after better. New Zealand’s indigenous biodiversity is not in great shape. 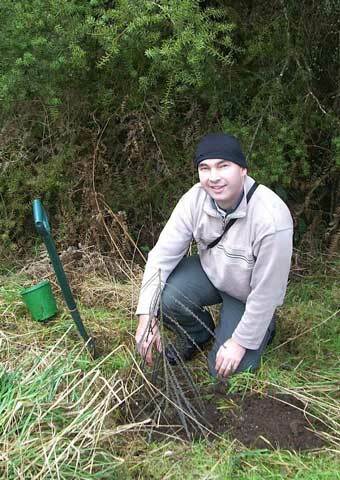 Me planting a fierce lancewood seedling into the threatened population near Taihape. Photo Fleur Maseyk. The juvenile leaves of the Taihape population are a comparatively dark colour. Photo Leon Perrie. A lot of my research at Te Papa – describing new species, distinguishing and mapping different species, and determining how populations and species are related to one another – supports conservation management. But my job does not often make an active and direct contribution to keeping things alive. So I was thrilled recently to play a small part in helping a very threatened population. Especially as it was a species I have a special interest in: fierce lancewood (Pseudopanax ferox). Fierce lancewood is sparsely distributed through the country. I’ve previously studied the genetics of its populations (abstract here; email me if you want a pdf of the entire paper; previous post here), and written on how its populations might be prioritised for conservation management. Now I’ve followed that pontificating with getting my hands dirty, literally. The population near Taihape is very isolated. Its closest neighbours are near Auckland to the north and Wellington/Nelson to the south. The Taihape population is also very small – just four individuals were originally recorded several decades ago. We found just two adults, and two self-sown seedlings. Viv McGlynn. Photo Graham Pritchard. Fortunately, Viv McGlynn (formerly of DoC) initiated supplemental planting, with support from Henry Dorrian. Seed was collected from the Taihape trees and grown by Douglas Gordon of Palmerston City Council. During a recent weekend, I joined Viv and other members of the Manawatu Botanical Society in planting 27 of Viv and Douglas’s seedlings into the Taihape population. This gives the population a bit of bulk, and increases its chances of long-term survival. We were also pleased to discover two self-sown seedlings in the immediate vicinity. 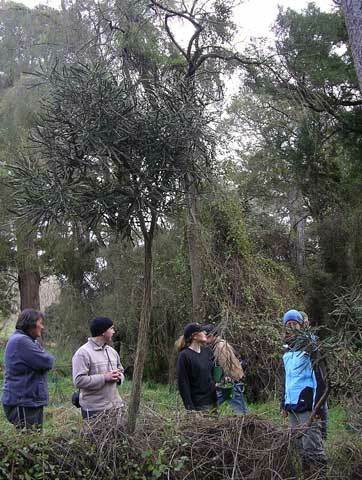 The Manawatu Botanical Society, plus neighbour, strategising beforehand, while standing underneath one of the adult fierce lancewoods. Photo Graham Pritchard. I think this is a great example of agencies and organisations working together to achieve a positive conservation outcome, albeit driven by individual initiative and good-will. I’m pleased you found our Pseudopanax ferox paper interesting. Hope your seminar goes well. Btw, I felt sorry you guys couldn’t collect more than 10 samples on the field, but don’t worry, here at Brazil there’s barriers for academic works too. I’m a bit lucky that my species aren’t in the red list from here.